This year’s Sea Otter Classic was the year of the center drive (mid drive) motor. OHM Cycles has introduced their new 2015 electric bikes that includes their new XS750 Plus with 3.25″ wide off road tires & BionX D Series system. The XS750 Plus and the XS750 both use the new BionX D series 500 watt motor that provides a lot of torque and is designed for off road riding. OHM is still focused on commuter/touring style e-bikes too with their XU700 and XU700 LS (low step). Both of the road models also feature the BionX drive system. The OHM Cycle XU700 and the Chicago skyline! This is a guest post from Cathy Lau, from OHM Cycles. It’s been only a few months since he bought his first electric bike, but already, Chicagoan Michael Landeche sees and experiences the city in a very different light. Electric Bikes: the new corporate vehicles! This is a guest post from Cathy Lau, of OHM Cycles. 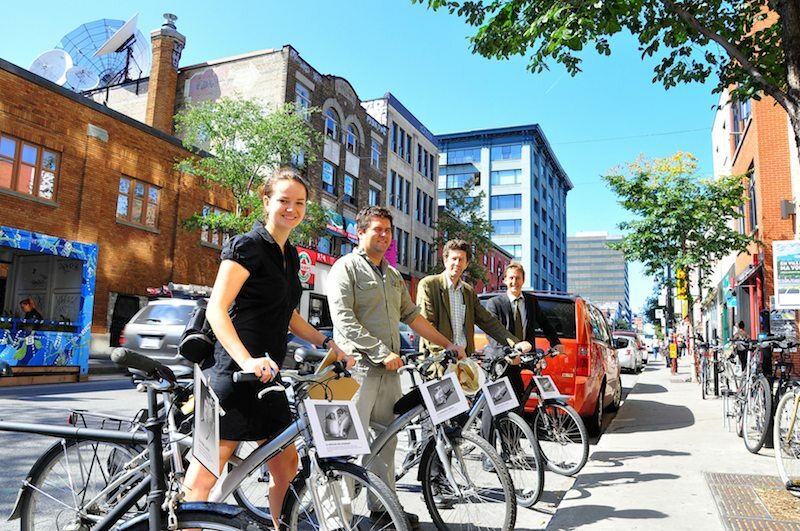 A landscape architecture firm in Montreal, Quebec, found a clever way to encourage companies to consider using e-bikes and greener modes of transportation to get around for business. Capturing the spirit of two concurrent events (Parking Day – an annual worldwide event where artists, designers, and citizens transform metered parking spots into temporary public parks, and “en ville sans ma voiture” – an event celebrating being “in the city without my car”), the company, Fauteux et associés, presented a playful display comparing the company bikes to company cars. Bob, his grandson, and his OHM on the John Wayne Pioneer Trail in Iron Horse State Park . This is a guest post by Cathy Lau. Not even age, two heart attacks, and a quadruple bypass can stop a cyclist with an OHM electric bike. What do you do when your passion for biking outlasts your body’s ability to keep up?